Our motel is located in a tranquil setting with a pretty garden. There are outdoor chairs and tables and a BBQ for guest use. Guests can also enjoy the salad and herb garden and there is a private heated spa (a great way to relax). The Coromandel Peninsula is a beautiful, rugged area fringed with dozens of great beaches and renouned for its natural beauty. The towns are of historical interest, with local museums, heritage trails and relics of the kauri-logging and gold-mining days. 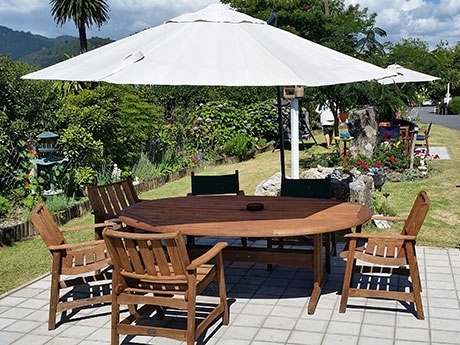 Renowned for its natural beauty – golden beaches and misty rainforests – the Coromandel has hundreds of natural hideaways, making it an ideal place to escape, relax and unwind. Coromandel Town has recently been voted as the top holiday location in New Zealand. 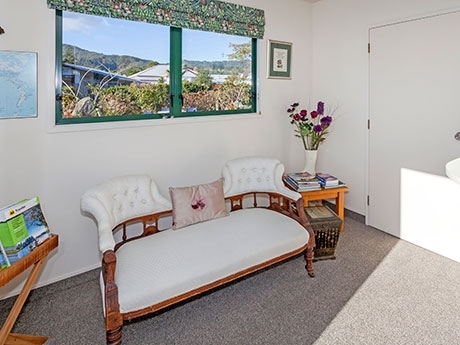 After approximately a 1 hour drive on the picturesque Coast Road from Thames you will find our motel located in a tranquil setting with a pretty garden and being set back off the road gives us peace and quietness. There are outdoor tables and chairs and a BBQ area with a salad and herb garden for our guests to enjoy. A favorite way for guests to relax is to enjoy a soak in our private spa pool (hot tub). The shops, cafés and restaurants are only a leisurely stroll away. We offer free unlimited WiFi and we have a breakfast menu available. It is affordable quality accommodation and inspection is welcome.